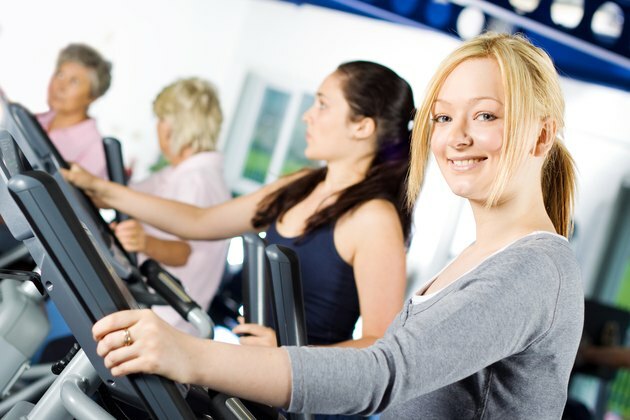 The elliptical machine is provided in commercial and private fitness gyms, and is available to purchase for home use. Although a piece of stationary cardiovascular equipment, elliptical machines track the distance that you travel during your workouts. How many calories you burn by riding one mile on an elliptical is dependent upon how quickly you complete the mile, the resistance setting on the machine while you're completing the mile and your current body weight. The faster you complete the mile and the higher the resistance intensity, the more calories you will burn. In addition, those who weigh more will burn more calories per unit of exercise time than people who weigh less. The more calories you burn during your workouts, the better your chances of losing weight. To lose body fat, you must burn more calories than you consume. Although the time it takes to complete one mile on an elliptical can vary greatly, you can estimate how many calories you will burn by using an online calorie calculator. If completing a mile takes 15 minutes, according to Health Status, a 150-pound person will burn about 193 calories while completing that mile.